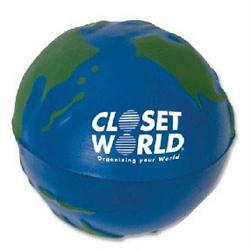 Put your logo on these Earth Stress Balls / Globe Stress Relievers and you are on top of the world! 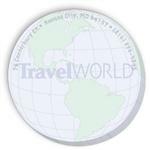 Give them away at your next environment/ecology "green" event. Keep them at your desk for a quick way to exercise your hands after working at a keyboard. We will match prices from US based competitors. Try our handmade, squeezable, logoed stress balls. We are based right here in the US! 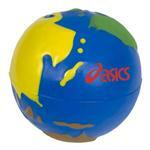 A RUSH CUSTOM STRESS BALL - FREE 1 to 2 DAY RUSH PRODUCTION AVAILABLE! Available Colors: Blue with green continents. Production Times Available: 5 working days. 1 day rush production available - call for pricing. Typical Imprint Area(s): 1" W x 7/8" H.
Available Imprint Options: Additional Colors/Positions: Add $.25 each. Bulk/250 pcs = approx. 17 lbs.